What a pleasant surprise: the reissue of one of my favorite African music compilations of all time. 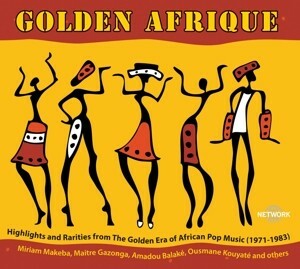 Germany’s Network Records put this one out in 2005, and at the time it was one of the most comprehensive collections of “golden age” (the years of and immediately following independence) Francophone West African music. Ten years later, it’s still among the best in its class. There are too many essential, can’t-miss tracks to summarize, so I’ll just highlight a few, starting with disc 1’s first three tracks, as good a recap of late 70s/early 80s Afropop as you’ll hear. 1-8, 9 and 10 are an excellent summary of Malian authenticite, 2-4 and 5 are perfect bookends for Senegal’s sound of the era, and 2-7 is sui generis, a Gambian psych-rock band that’s still ahead of the times. The packaging (40-page booklet with notes in three languages) is worthy of the subject – it can’t top the original longbox, but this one will actually fit on your shelf. It’s a perfect gift item for your favorite African music lover.